FOR ADOPTION: TIGRESS is a sweet, stunning adult female looking for a family to shower with her love. She showed up as a stray on a farm in the Evelyn area and was never claimed so she came into the care of NWAS. Tigress is a bold, confident and extremely personable. She is drawn to people in general but had a special soft spot for children. 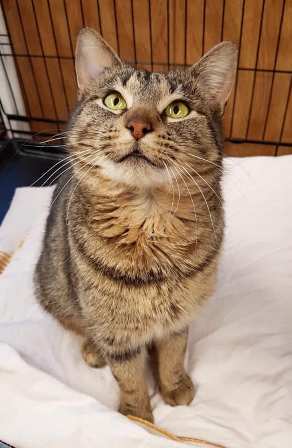 Tigress is a kitty that will gladly spend an entire day curled up in your lap and will likely expect to be able to sleep in bed with you at night. When she is not busy cuddling Tigress enjoys spending time supervising while you do household chores and exploring indoors or out. It has taken Tigress some time to warm up to the idea of sharing her space with other animals but she is now doing well with the other cats. She was traumatized by a dog that continually chased her prior to coming into our care and seems to be holding a grudge against the species in general but we do think she could learn to trust a very calm and gentle dog. Tigress is spayed, vaccinated and up to date on parasite control. If you've been looking for an extra special cuddle buddy apply today for a chance to meet Tigress!